This has been a busy week and it's 5pm on Sunday and I'm only just NOW getting to writing this. I'm still sick (this cold/cough/life ruiner/flu is still hanging on, thankfully just barely), I did a lash lift training, I did an instagram takeover (so much work! ), I started a new job and worked the farmer's market for my boyfriend's business, which leaves little time or energy for blogging and filming videos. But overall, life is REALLY good and I want to fill you in... PLUS, this is week twelve of my twelve week challenge! So let's start there. I did it! Twelve videos and twelve blog posts in the past twelve weeks! (Video twelve will air tomorrow evening) I want to thank all of you who joined during this time and all of you who have been longtime subscribers for supporting me here on the blog and also over on my YouTube channel. It truly means the world to me that you're interested in my content, that you respect my opinion and product recommendations, and that you all leave the most lovely comments and encouragements. It really motivates me to keep doing this. In the past twelve weeks I've doubled both my instagram following and YouTube subscribers. That's just about 1,300 new peeps on each platform! SO COOL! I've started doing collaborations with companies, which is a surprising amount of work but such an awesome opportunity. You want to give me free product to make a video? Okay! I'm even starting to earn a little money which, after two years of being injured on worker's comp, is really helpful! Oh and Buzzfeed even asked to use one of my videos on their site. Unreal! I'll let you know when that's up. But the coolest outcome of all... I landed my dream job! Well, it's not 100% finalized yet so I don't want to jinx it. I'll save that for another post once the contract is signed. But I truly believe that my videos, which I included in my cover letter and resume, were able to show this fantastic skincare company (who will remain nameless) my passion for skincare education. So thank you, all of you, for being apart of this personal challenge and motivating me to keep it going! I truly appreciate every single one of you! If you consider blogging/vlogging a job, which I do, I'm about to have THREE! Three jobs! But that's good. I'm so very ready to be busy. Being injured the past two years was the worst and most boring experience of my entire life. I've literally had nothing to do for years. Years! So now, this year is the year of the hustle! I'm super excited to announce that I'm finally putting that ol' Barbering License to use! I'll be doing lash lifts at Iris and West part time starting this week. 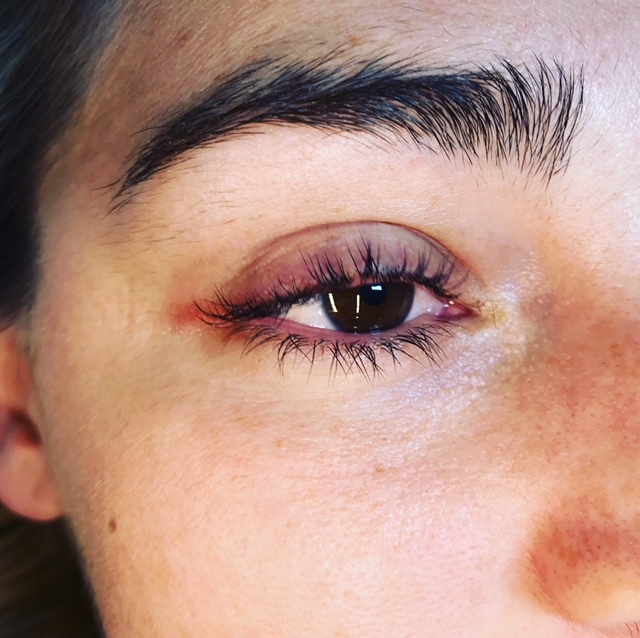 So what the heck is a lash lift?! Lash lifts curl, set and condition your natural lash giving you a little extra oomph. This is a great service for anyone with sensitivies to lash extensions or someone who wants an enhanced lash but loves facial oils as much as I do. It costs $110 and is a 90 min service. Your lash lift will last up to 8 weeks, making it not only gentler on your lashes but also on your wallet. You can't get them wet the first 24 hrs but once they're set you can do whatever you'd like to them. That includes steam, saunas, mascara, oil cleansers, lash serums, you name it! I'm offering $10 off your first lash lift when you book with me this month! So if you live in LA, make an appointment here. And if you live in SF, go see Amanda, the talented and lovely owner of Iris+West. As you can imagine, I'm about to get pretty busy. I'm feeling that weekly videos might not be the most realistic thing for me. I love doing them but they are a lot of work, especially when you live in a tiny apartment and have to set everything up just to break it all down. Every morning my best friend and I send each other voice memos. We share what we're thankful for, our goals for the day and our goals for the future. Almost every voice memo I send ends with the goal of having my own filming studio that's set and ready to film at all times. That and in unit laundry. What luxury! So until then, I think I might back down to two videos a month instead of four. I hope that's not disappointing. As I type this, I hear Gary Vee's voice in my head yelling "You're not working hard enough!" But don't fret, I'll still be doing a weekly blog. As always if there's any topic you'd love for me to talk about or any questions you might have, please feel free to reach out! You can contact me here, DM on instagram or comment on YouTube. I love hearing from you!